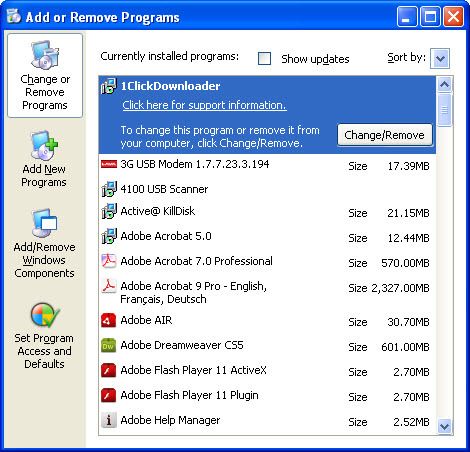 The Add/Remove Programs feature allows a Microsoft Windows user to uninstall an installed program from their computer. Below, is an example of what this screen looks like in Windows XP, as can be seen you're presented with a list of currently installed programs that can be selected and the uninstalled by pressing the Remove or Uninstall/Change button. This feature was first introduced with Windows 98 and was later renamed to Uninstall a program with the introduction of Windows Vista. Double-click Add/Remove Programs or Uninstall a program depending on your version of Windows.